The vector is made from a picture of the second opening (I've some problem with Hibbox so I can't put this picture). I thought a long time for the BG, and tried some different versions (as usual...) I hesitated to keep the original BG (cherry blossom), but I finally chose changing it. 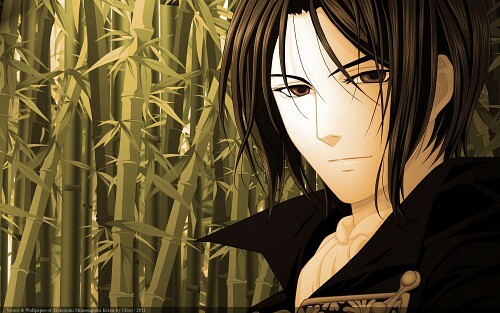 I like bamboo, it's a beautiful vegetable, and it fits this character in my opinion. So I vectored some bamboos to make a forest. There are some bamboo pieces behind the main vectored ones that look very pixelated and the lighting makes no sense, it's like someone holds a lamp in his face. Vectoring is good, but pay more attention to details. "bamboo, it's a beautiful vegetable"
In what world it's a vegetable? I think the background is a mess, it's very crowded and you didn't bother to finish it, I can see a LQ image behind the vectors. Also the image in the far back is way too pixelated & low quality for the wall, it has no business being there. 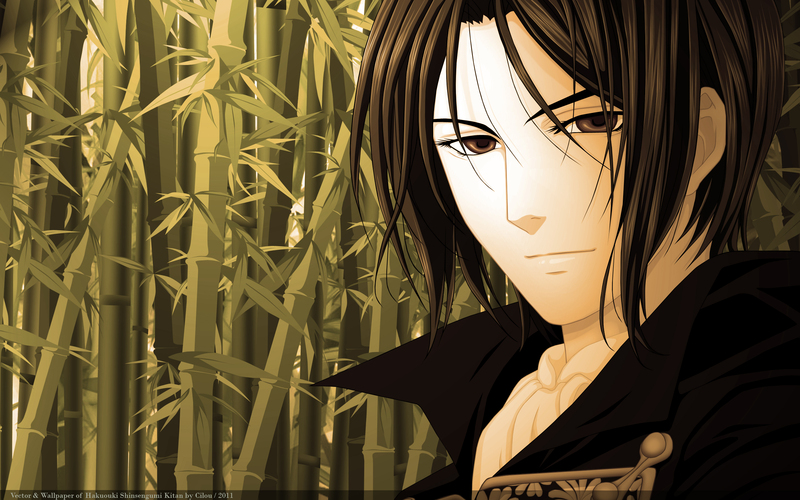 The bamboo needs alot of shade, you detailed the vector but forgot the BG. Try not to rush everything, this is what happens when you do. Also, Bamboo is not a vegetable... http://en.wikipedia.org/wiki/Bamboo there you go. Well I see you've vectored parts of this for the bamboo bg: http://hd-wallpaper.org/95__Japanese_Bamboo_Forest.htm Without crediting your references. I recognized it instantly. Because of this, you added various bamboos too and they all have a different style, adding to the "mess" others talked about. when you added something too much, it won't look good either. that's what i was lookin for! Uhm Cilou, you have been a waller for long time enough to understand that there's so much to look aside from just being prolific. You have submitted 139 wallpapers here and only a handful of them look actually finished and well made. Your wallpapers deserve that they get more attention before being submitted. I honestly don't understand what's going on with the background. The furthest bamboo layer is pixelated and enlarged, the next layer is painted and detailed and then the layer depicting the closest area of bamboo is just vectored and looking flat. There's a huge lack of cohesion in this wallpaper. I really hope you take what we say and actually take your time before submitting something, no one is rushing you to make and finishing walls, because you already proved everyone you're really fast at walling. Oh, Hijikata;s eyes changed colour again! It looks not bad, nice art work! this pic looks so flat and messy but not too bad.